Very interesting! Always refreshing and a rare opportunity to have someone who never worked with computers before. – that’s why I love user research, especially not confined to a lab. I look forward to reading about methodology and results later! 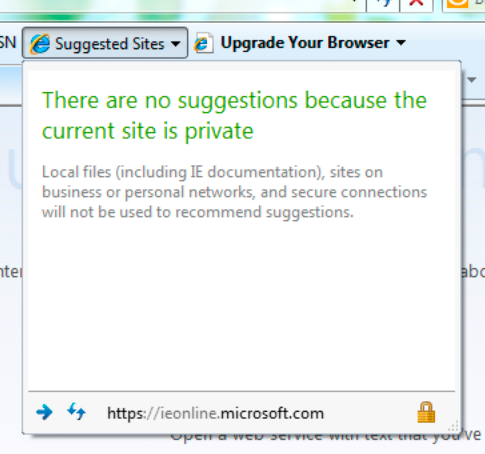 Seems biased to me the fact that IE had no suggestions and Chrome had a list of “Most Visited”. Nevertheless, interesting. Let’s not show an entrenched English speaker Japanese and claim that it is the language’s responsibility to immediately map to his mental model of English. Learning falls on a motivated student (which Joe, with self-proclaimed “no excuse[s]” for never using a computer, was not) matched with an evangelist like yourself, in the event of a total failure of comprehension. I agree with what I think your point is – that our interfaces are not natural. They require us to build a new system of patterns to match with encountered interfaces of a similar kind, in order to know what we’re doing. Same is easily said of learning any new language, visual, written, or spoken. But to suggest that iconography and buttons in general are unique to digital interfaces is inaccurate, and recounting one man’s first interaction with a computer as “user testing of browsers” comes across as a sensational misrepresentation of what user testing is, and what education-by-interface should be. What seems obviously a button to you could be seen as a decoration by someone with no experience at all. This makes me scratch my head over the failure of things like BOB. Also, it makes me wonder if the iPad is not so much enlarging the market for computing than it is targeting people frustrated by computing. I know what you mean. I taught my grandma how to use gmail the other day, and it was exactly the same thing. I think the next exercise is to introduce him to vim. – some combinations shortcuts are not very good – I explained the man (which did not have a good vision) that if you press Ctrl and + at the same time, the text will be bigger. He was very pleased first… but every time he wanted to do this, he really searched the + button… then he asked me why didn’t they make a single key for this awesome thing, or put a big icon on the monitor, that was simple to click. These are my experiences… I hope that touch technologies and good UI for starters will change things around in the next years. This was very interesting. I remember teaching my parents how to use a mouse. It’s not that easy. Your experience seems enlightening. What worries me is that computers will eventually not do anything interesting because it is too hard to get a new user to use it without education. You aren’t suggesting this at all. It just brought this worry to my mind. I want computers to be easy to use. I just also want to continually get better. As I learn the software, I want the interface to change. I remember once reading the distinction that computer interfaces are not intuitive, but familiar, and that changed the way that I think about designing interfaces. Most of the time, we are designing for audiences that are familiar with some internet constructs, and that gives us our basic guidelines, but we confuse those learned patterns with intuitiveness. To design an intuitive interface for users not familiar with computers or the internet would be a lot more work. Normally, an interface designer has to decide to fall back on that familiarity because the larger audience is familiar with the internet and wants to use that familiarity to get things done. Something that was designed to walk someone through a task step-by-step would be good for a user like Joe in this story, but would drive younger generation users up the wall because of how long it took to get anything done, or because it doesn’t behave like the interfaces that they are used to. You would get different results with a child that has never used a computer. Wow. That’s a great write up of an incredible situation. It sounded like you were being really patient, but it highlights how frustrating and personally demotivating it can be to encounter a situation on the web where you feel confused. Incidentally, I often user-test English language sites on non-English language speakers. They do the opposite – ignore the text and pick up on the subtle UI elements pointing the way. It’s useful to blank out all the nice copywriting you’ve done, and focus on whether someone can instantly ‘get’ a website. Help systems are notorious for telling people WHAT features a program has available, explaining in detail HOW to use a feature, without telling you how to actually FIND that feature within the program in the first place. Feel free to come to central Vermont sometime. The beer is good and we have rafts of people who have never used computers before. Around here it usually winds up being the libraries that are the places people go to learn and we have mixed results since in many cases the librarians don’t have a lot more tech savviness than the users. I teach novice users how to use computers and the internet for a job here. I wrote a book about how to help people who have never used a computer before learn the basics. The whole process is far less intuitive than I think a lot of us geeks think. Not only do people not use tabs, most of them don’t know what a link a URL or cut/paste are and still they manage to hop around and do whatever it is that needs doing, albeit in weird roundabout ways. This was an interesting though not surprising read for me. Interesting, but doesn’t really reveal much beyond that man who doesn’t know how to use a certain piece of equipment will struggle and get frustrated without training and guidance. It’s like taking someone who has never seen a car and asking them to try driving it without any instruction. Or asking someone who can’t read to look at a passage of Shakespeare and tell you what it says. It’s not realistic to expect software to accommodate complete novice users. I agree most software developers could do a damn sight more to make their products intuitve and helpful, however they have to be allowed to assume that the user has at least the basic skills of interacting with a computer. You could really improve the user experience of your readers by making your text size bigger. I think the problem is unrealistic expectations. That constant strive to create a family sports car equivalent with software. But that family sports car doesn’t exist in reality. You can’t have both, you need to decide early on what you want to focus on and achieve. Novice users will find it rustrating to use something that doesn’t hold their hand while experienced users will find hand holding annoying. You can’t just get a car and drive it, you need to learn first and pass a test. Also for many other things you also need training, why is it assumed with computers that people don’t need training? The software, applications or anything on it should be so intuitive a caveman can use it, right? No, it’s not right to think that way. The problem is deeper than the interface, content, OS, browser or app. It starts with people and expectations. Someone who passed their driving test last week won’t win nascar next week. Experiences should be appropriate to the skill level and audience, this is why it’s difficult because they don’t align. 10 people may like cars but only 2 are great at using computers. How do you cater for the same demographic with different levels of tech skill? No matter what you do will annoy one of them, going back to the hand holding and lack of it. I don’t know what to say… the first time I touched a computer I was like 8 years old, its like I born knowing how to use computers… It was a Windows 3.1 computer and I only remember that I managed to open solitaire, I still don’t know/remember how I managed to get into the Games folder in Program Manager, but I do remember that it took me less than 2-3 seconds to learn how to use the mouse, unfortunately my mother scolded me that day because the computer wasn’t ours, so I didn’t touch a computer in like 2 years after that day. I was never been exposed to a computer before and for me it was a TV with a “new model VCR”. I got my first computer at 10, 2 months after that I formatted it putting in the Windows 98 disc and selecting every option without knowing what I was doing, I still remember that I was really scared because everything looked messed, didn’t have sound, etc, because it needed drivers which I managed to install putting into the computer every disc that came with it “hoping it would get fixed before my mother came back to home”, I managed to install drivers and get everything fixed because the discs had the installer in autorun, and the installers were “Next, Agree, Next, Next, Install, Finish”, the same as nowadays installers. I’ve had similar experiences doing usability tests with people who have both low literacy skills and low computer skills. You can see how hard they’re trying to figure things out, but they’ve formed no mental model for how the browser/web works. I once had a participant who had used nothing but WebTV. Using Google on a desktop completely flummoxed him, as he had no idea which were the links on the page. Fascinating article. Thanks for writing it. Very interesting article. 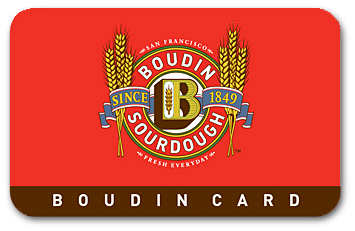 It makes me want to take a step back and redesign some applications from the ground up. Try to teach your elderly mom how to use a computer and you will understand how FREAKING COMPLICATED they are. It’s the little thing that sometimes is a straight up and down line, sometimes is an arrow, and sometimes is an hourglass. It’s the thing that moves whan you move your mouse. “So if I move the mouse *this* way, the cursor is the thing that goes *that* way? and on and on. OTOH, I took her to an Apple Store and she had the iPad going in 2 minutes! It’s disturbing to me that people reading a blog on interface design don’t know that they can easily make the type bigger. Especially since it’s explained in the comments. Hold down the key labeled “Ctrl”. While doing that, push the key labeled “+” a few times. Reading through this post irritated me. How the hell does Joe not get it? The mouse is the most intricately designed piece of hardware ever made for a computer. You just point and click, point and click. He just doesn’t know, he should have learned this by now, he has no excuse for not taking a class on computers. @tom – totally hear you! I had a very similar experience with my Grandmother a couple years ago… she “couldn’t get her email to work”. So when I was back for a visit, I asked her to show me how she accessed her email. It was only then that I realized she wasn’t clicking on the text box. She just started typing like it was a typewriter. It is a good lesson not to assume anything about your users. Related, I was back a couple months ago with my iPad. She loved it! Initially she was nervous about touching it, but within minutes she was smiling and exploring. She loved the photo galleries/videos/visual aspects of it. She also liked that about my android – probably for similar reasons (touch/visual). I had a very similar experiences with my parents when they were first starting out. What I had a hard time explaining was the number of search fields a typical user is faced with on a single screen — some times as many as three or four (counting browser chrome) for an average e-commerce site or blog. To a newcomer it’s instant paralysis. Despite the roadblocks, my mother (who just turned 70) is now an expert emailer, runs multiple video conferencing apps every night to talk to her relatives, and happily browses the web sitting on her couch with an iPad. Do you know how to run a drill press? Don’t be a jerk Many times, technology isn’t actually designed to be easy to use. Knowing that the + sign enlarges the screen isn’t intuitive–I can’t wait for touch screens. Besides teaching intro to computers to college freshmen, I’ve also experienced watching both my aging parents and my 3yo learn to use the computer. My parents often give up. The 3yo plays around till she finds something that works. The thing that moved me most about Joe was not his frustration level (that is to be expected) but his self deprecation. He seemed to think he should know how to use a computer. I found this article by a RT of a RT on twitter. But I was so moved by Joe’s experience that I used it as the base of my own blog post today. http://wp.me/p1qnT4-el Is it really “Keeping Up With the Joneses” when computer technology is so pervasive that Joe couldn’t even get discounts at his local bakery unless he had an e-mail address? At what point does the luxury become the necessity? Getting the initial user experience right is critical. I wish I knew how.. Fascinating. As someone who does UI design I keep insisting that we simplify and build with the assumption that people like Joe will be our end users. Of course I’m a lost voice in the wilderness. for people that do web development it is really hard to get back to a level of “innocence”. we take our knowledge of the web and software in general for granted. we consider the users but I think we over estimate their abilities quite often and by a substantial amount. I read another blog the other that was centered around the quote “90% of users are idiots”, not making fun of users because I love to write software and play with open source but there are other times I want things to “just work”. This is actually why CLIs are considered the most easy way to use a computer for those who are not at all familiar. That said, it would be helpful if more applications provided a text alternative to the icons, like ReKonq from the KDE project. For example, check out this screenshot of ReKonq. It is almost default except I have selected the option “Text Only” for the toolbar. but I just wanted to find some local restaurants… what is this place? The help is for the browser software, but the user wants help on the web content. Wrong help! Like reading the car’s user manual to find out how to get to the grocery store. The golden insight though is why the user wants an email address. Sometimes the motives are not what we assume. When I was first learning how to use a browser, I was confused because I was told to “highlight”, but selecting something actually makes it darker. Kind of an eye-opener to read about things that beginners don’t know, which is a foreign point of view for me at this point. And now my mother, who is old and far away, is thinking about getting her first computer. She tried one once but couldn’t operate the mouse. Well said. I am a public librarian and teach a monthly internet basics and it is very difficult to help people make that first step when they don’t have a vocabulary for what you are attempting to teach them. Thanks for that! I really enjoyed reading about Joe’s experiences and your observations. It’s often good to return to square one from time to time. I think Solitaire on Windows is a clever plot to deal with exactly this problem. Start with something that doesn’t require any training because it’s familiar – a game of cards – and use it to teach mouse movement, double-clicking, dragging and dropping and all the other stuff that causes pain. Then you go on to Minesweeper, which teaches right-clicking as well, albeit in a way that isn’t used in other software. Between them, they’re a master class in mouse skills. I believe the first lesson for every computer newbie should consist of nothing more than a few games of each. The problem for Joe is that computer interfaces are built for most people, not the least able person. I think that is a good thing. I don’t want my hand held, I don’t want suggestions or help. I want to do what I want as quickly and easily as possible. Certainly something can be done for Joe and people like him, but don’t dumb down the user experience for everyone. With respect, you only need to know some things at the point at which you need to know them. Many people have grown up in a world where they didn’t learn computers in school, went into professions where they didn’t need to use computers and are just now getting nudged in that direction because they need or want access to services that are only accessible via a computer. Or they’re new to this countrt and came from a country that is much less information rich than the US. In Vermont I see people getting online for the first time weekly. Some of them are interested in getting email with photos of grandchildren or staying in touch while they are on vacation. Some of them need to file for Unemployment and you don’t know anxiety til someone shows up at your door needing to fill out a set of forms [not very well-designed forms, I hate to say] online or they will not get money that they need. It’s a tough issue. The really worst and saddest example we’ve seen in the library world was in post-katrina New Orleans where your options for getting relief money from FEMA were calling them on the phone (at a number that was basically always busy) or filling out a (badly designed) form online. If you had never used a computer before, an always-busy phone seemed like the worst of those two options. Librariand and volunteers in NOLA spent a lot of time teaching people how to use a mouse. So you can make the argument that using technology is like driving. It’s an important thing to know even if you’re not going to make use of it, just in case. But there’s a corresponding argument that there are people who can’t, for whatever reason. With driving maybe you have epilepsy or vision problems or who knows what. With technology you may not own a comptuer or know anyone who has a computer. The thing that tech-savvy people don’t understand is not just what it’s like to not have a computer, but what it’s like to live in a culture where you don’t even really know anyone who has one. And even if we decide that technology is someething you need to know to be a citizen, whose job is it to teach people. Right now it’s schools and public libraries. These information poor cultures exist and are all over the US. 20% of Americans don’t use the internet at all. A small percentage of these use non-internet-enabled computers. These people are real and all around us. But they’re often socially disadvantaged in different ways: they’re poor; they’re non-English speakers; they’re disabled; they have low education; they have various emotional/mental impairments that make learning new things incredibly difficult. Sure, you can teach people to use a mouse, over time. But you have to make learning these things into a genuine option for the people learning, not because they need to keep up or because you just can’t believe they don’t know it. The discounts example here is great. That’s what makes Joe motivated to learn. Whether people have an “excuse” or not is fairly immaterial to the fact that they have an information/technolgy need and live in a country with a wobbly-at-best infrastructure for teaching them. We can do better. I’ve been using computers for over 30 years, so I need this reminder of what it’s like to be new to them, because I can get impatient with those I’m trying to teach. Thank you for this! I’m gonna Tweet it now, where Joe will never find it. OK, I keep holding down the control key (I do not have Ctrl key) and the + (both of them, with and without shift) but the type never gets any bigger. But I tried command and + and it worked fine! I think the new mobile OSes are doing a good job of eliminating many aspects that are confusing to newbies. No more double clicking nonsense, no more directory/file paradigm, no more scrollbars, and no more windows. However there are still several areas that can be improved. While pinch zoom is easy once learned, it’s not very intuitive, and copy-paste in iOS and Android is horribly frustrating. Why can’t copy-paste use the simple linux/unix paradigm, highlight the text, and then click (or touch) somewhere else to copy it? The explicit ‘copy-paste’ steps are redundant. Thanks for sharing. Boris, may I use that experience in Software Engineering class? I used to discuss new flows with my colleagues, trying to convince them by saying that consider me as a Mad User who knows nothing now how will he use this feature, and this approach really helped simplifying stuff. I’ve got to say that I’ve witnessed something similar to this, but on a slightly different scale. A little background: I’m a software developer who helps out at a local charity who help asylum seekers and refugees; I’m their on call IT guy. They sometimes have me come in and give basic IT classes to some of the newer asylum seekers and refugees. I met one fellow, last week, who was from Iran. He came to my country 10 years ago, and had decided that he needed to learn to use a computer, last week. He’d bought himself a laptop (so that he could VoIP home), but didn’t know how to use it. I started off with my little talk about what computers were invented for, and that everything is (usually) just an abstraction of real life stuff (a desktop is an abstracted version of a real life desktop, a hard drive is like a filing cabinet, etc), and got him to do some web searching – similar to what Boriss set Joe doing. I quickly found out, though that this gent didn’t even know how to use a keyboard. Coupled with the fact that English was his second language, this made for quite a challenging lesson. I suppose what I’m saying is (similar to what Boriss says at the end of the article): Users have completely different experiences, and use them to infer their own decisions and ideas about how they should use the software. When you’re designing your software, try not to assume anything about the user’s experience. At this moment of development of our civilization, we will just have to skip the ones who are so far behind in knowledge. For example, you have to understand that there are people who live close to the cities (farmers, villagers,…) yet they never saw a traffic light. Does this mean that on every possible streetlight in the city we should put tutorials what does the red light mean and what does the green light mean? No. Quite a lot of things that surround work because you somehow learned how to use them. Be it by accident or on purpose, you know how to use stuff. And designers develop new things (hardware, software, …) based on the fact that 95% of the population has knowledge already implanted in brain by the time they are adults. Can you make fonts MORE SMALL? I was fascinated by this. I’ve dealt with people in somewhat similar situations. They’ve used computers before, but only 20 year old green and black terminal screens and they have a very fixed idea of what using a computer means – showing them a new system gets comments like “No, this is not the path to do that. You go X then Y then Z” (where XYZ is basically an arcane list of menu options and workarounds they’ve learnt as the system changes). I’ll pass this on to some of the UI staff I know – I hope at very least Joe’s ‘Help’ menu experience will give them some ideas. Re: goranpeuc’s comment about leaving those who are so far behind in knowledge: you’re right that a lot of society’s artifacts assume previous knowledge or understanding – but that is not an argument for abandoning simple and clear interfaces and help systems. Children aren’t born knowing our systems and we teach them. Even if you don’t care about Joe, surely it’s a good idea to make our systems easier for other new users? You say “[they] work because you somehow learned how to use them” and you’re right. Let’s make that learning process easier. Let’s also hope that future designers think this way, because as I age I’m going to have to learn to use radical new systems that are totally unfamiliar in the future. 10 years later, I developed a GUI app to replace an old (80’s vintage) HP terminal for an Air Force program. The app had to work ‘just as bad as’ the terminal program. This was targeted at Air Force technicians (18-20 year olds) who’s computer experience ranged from ‘super-geek’ to ‘never touched a computer before’. As strange as it seems, there are still kids out there that are in the later category. This reminds me of how I panicked when FireFox tricked me into getting their newest version – I can’t find anything on it and HATE it. Luckily I was able to search and find and reinstall the older version I know how to use. Sorry to disagree, but the problem is not the computer interface itself or even the input devices. My 5 year old boy has been using my computer since he could sit straight (and it is not an apple). He is still learning the alphabet but he can sit for hours playing games, surf kids websites or watch videos, I even have pictures of him with my headphones and his little hand barely could grab the mouse. Why mister Joe No-Tech got frustrated and my toddler did not? I only sat my kid and told him once what the mouse did and voila! I believe age can make a huge difference. While a toddler will lack fear a 60 year old will have it in abundance. My parents even have trouble connecting their dvd. To many seniors the problem is not the technology itself but their fear of failure. They tend to over criticize their performance and feel very dumb. What can we do to prevent it? If age is the real culprit, all of us should record on video that we are not dumb, that we never lose our ability to learn and store it, so when our grandson comes with a bizarre piece of technology we could play it, forget our fears and start learning again. My neighbor was told how to use a mouse a number of years ago when she was working on a Windows 95 computer. As a joke she was told the the tail of the mouse (the cord) points to the front. Every time she move the mouse to the right the cursor would move to the left. When she move the mouse down the cursor would move up. She never learned on her own that this was backwards. After watching her struggle and curse computers for over two months someone showed her the correct way point a mouse. I feel like the results here are not an accurate representation of people who are new to computers. I feel like new computer users, who enter the situation genuinely wanting to achieve a goal, will succeed at a higher rate than Joe. Simply being told: “find a restaurant” is a flawed test. Joe has nothing riding on finding a restaurant, plus 60 years of experience has taught him that all he needs to do is walk down a street and he’ll find a restaurant. If there were some stakes that had an impact on the user’s real world, then we’re in a different playing field. Joe knows that using a computer is unnecessary in his life (although it does provide the luxury of discounts). Whereas most other new computer users (majority of which are kids) have much more to look forward to in an online environment. Things such as games and social interactions await in the computer world. When you want or need to learn something, it doesn’t matter if there’s not an arrow pointing to a white box telling a user to click there before typing. You figure it out because you WANT to figure it out. Fascinating stuff. Simply fascinating. I missed a trick as my own parents aren’t much further along the computer experience road than this fellow, but I’d feel awkward about blogging about how they would use a computer. I recall one time, though, seeing my mother unwittingly operating a mouse with both hands. She was moving it around with one and using the other to operate the buttons. To give her some credit, she suffers from some arthritis so sometimes achieving a good ‘fit’ on a mouse would be more difficult than for the rest of us. Compare her to her grandson (my eldest son) who is still under 5 years of age and can operate a mouse and my iPad with surprising dexterity. He’ll grow up alongside computers and not know a life without them; in my own case I recall the first time I ever used a computer (in the early eighties – it was a BBC Micro) and how bewildering that was to my seven-or-eight-year-old self. So interesting. My 5-year-old daughter has been starting to use the computer recently, mostly Windows Paint. I remember in 1986 when we got our Apple IIe (I was six), I spent a lot of time using the tutorial software that came with it, about how to type and use the mouse. I think there was a rudimentary intro to AppleSoft BASIC also. I never looked to see whether Windows offers similar. Wow. this is very interesting. if nothing else, it shows how much computer operating knowledge is inherent in all of us that we take for granted. My wife works at a public library and does this all day long. It always surprises me when I hear of someone who can’t use a computer. I don’t fully understand the meaning of this post other than, “This is an experience I encountered”. There is nothing to learn from this experience. A skill is called a skill for a reason. Look it up http://dictionary.reference.com/browse/Skill. The point I am trying to make is that everything we do in life requires some level of skill. If Joe has never driven a car himself, if you were to put him in the drivers seat, I am sure he would just be as afraid. Is it the car’s responsibility to teach the driver how to drive? No. Its the users responsibility to learn how to drive, not the cars. The computer and browsers are tools, just like that car is a tool. The browser nor the car should be responsible on teaching the user how to use it. You learn how to use tools elsewhere. Does this mean that I believe that tools shouldn’t be simple to use, no, but just because I believe the tools should be simple to use doesn’t mean the tool should teach me. Teaching and simple to use are two very different things. Someone who has never used an ice maker from the refrigerator/freezer might also be intimidated from it, but that isn’t the ice dispensers fault. Finally, if anyone here is to blame, it is the people that Joe surrounds himself with and himself. People like Joe should realize that we all have a responsibility to learn how to use things in a timely manner in order to be productive for the future. We owe it to ourselves and society. We all need to stop thinking that the tools are to blame. Its a tool. That’s it. Not a teacher. Nice read by the way, just nothing to learn from it. Awesome research Boriss. As a UX designer I want to solve Joe’s problem, but I think he’s right: at such a low level, taking a class is better than any “tutorial” experience we can bake into a product. I wonder how different things would have been if, instead, the test presented an automobile to someone who had grown up driving a horse-and-buggy, or presented a horse-and-buggy to someone who grew up driving an automobile. So, do we believe in this rule across the board? If you said yes, then think violin, automobile, writing, tying a shoelace as a child, and ask the question again. Do any of these meet Ted’s rule? Are the browsers tested failures if they don’t? If they are, why is the violin not? For sure, there is no excuse for making things more complicated than they could be. It is easy to make things hard, and hard to make things easy. Yes, our job is to define appropriate complexity for any given product in terms of the intended user. But we also know that at a certain point, we have to make assumptions. What I find interesting in this anecdote is not the commentary on the browsers; rather, it is the questions that it provokes concerning how we manage that awkward stage of transition from one culture to the other. Is there a step that we have missed? Are there training wheels that can be removed, so that once one is over the hump, the experience going forward is not compromised? After all, if the product has any longevity, the proportion of the time that we spend with it as a novice is a likely to be a very small proportion of our experience with it over its lifetime. And yet, if the training wheels are not there, there is a good chance that our time as a novice will constitute our entire experience with the system, because we will walk away, never to return. Based on my years of research on computer skills and computer literacy, Joe’s story sounds quite familiar. I’ve run across many just like it, and I had people like him in mind when I wrote my book (The Ultimate PC Primer). I’d also like to validate your conclusions — what you learned from Joe. In order of your bullet points: 1. Yes, newcomers are no longer assumed. 2. Linking known to unknown is how most learning happens, and that’s why metaphor and analogy are so useful and have been leveraged so often in both computing design and learning disciplines. (I have a post to be published late next week on this topic.) 3. Exploration is key to computing, but hard to get newcomers — especially older newcomers — to engage in. 4. Indeed, assumptions generally get us in trouble with someone. In regard to modern technology, it seems most design is now focused on previous adopters, not new ones. Thanks again for taking the time to report on your experience with Joe. Very much appreciated. I find it extremely biased that for IE you showed what’s basically a blank page (instead of the default MSN search page) and for the other two browsers you actually had google search page and the app store search page for Firefox and Safari respectively. Were you afraid that MSN might have been too helpful and disprove your thesis? Polly Proteus, unless I am mistaken, he was using the DEFAULT setup for each browser. Had Microsoft kept MSN as the default opening page, then I believe that is what would have been shown. An interesting article and even more interesting comments. I’m 70 years old, as are a lot of my friends, and we grew up and were schooled before (gasp! could it betrue) the personal computer was even invented. If the frantic rate of change of technology, buggy,car,crystal set,TV, PC, WiFi etc. continues it would be interesting to observe how well those heaping scorn on the computerate illiterate will cope with later changes when they hit my age and their faculties diminish, which, from personal experience, I can guarantee they will. The best time to learn anything is at an early age. Young children usually have a desire to explore, little fear of failure and store knowledge like a new hard drive. There are at least three factors which influence our learning. Need to know, ability to learn and assistance from capable trainers. I should add a fourth, determination. 5 years ago, for business reasons I required a complex program, and couldn’t afford a custom solution, so to the astonishment and probably horror of young IT graduates, decided to try to teach myself to program in Visual Studio and SQL. This was the need. As for ability, I don’t have a natural affinityfor this type of work and I also know my ability to recall things has diminished with age (hard drive is full). No complaints, it’s just a fact of life which has to be recognised. Thus for me I understood I’d never succeed on my own ability. The solution, ask questions and don’t be ashamed to admit to lacking the know how. My assistance came from a young guy 12000 miles away who I luckily contacted on a forum. He being self taught understood my pain, but is also a really competant programmer, and has been my crutch through the learning experience. The resultant program has around 80 forms and a couple of thousand stored procedures, and is adequate for the task. Incidentally, despite thousands of email and lord knowns how many hours of help, he wanted nothing in return. Yes, there are some wonderful young people in the world. My major contribution to success in this matter has been simply a need and determination to succeed. One thing I did understand was to try to make it intuitive for novice users as most of my staff have limited knowledge about PCs. and I’ve had more than my share of frustration with professional programs. Have you ever had a program not install, and been told to look up the help files which are contained therein. When Google arrived it became my friend! The DSLR I just purchased as a “guide” mode. I’ll never use it, but for complete noobs it could be useful. Something similar might be useful in Firefox for people like Joe. I wanted my Dad to download Apple’s Facetime so we could talk, as it seems to connect when iChat won’t. But it just becomes more pain than it’s worth. First you have to open up the App Store application. Than you have to find the Facetime application. Then you have to purchase it…..oh wait, you don’t have an Apple account……OK, let’s forget this because I really don’t have the patience to run through setting up an account for you right now Dad. So interesting!! Thanks so much for sharing. I forget that people like Joe exist, but it’s important that we remember that they’re out there! 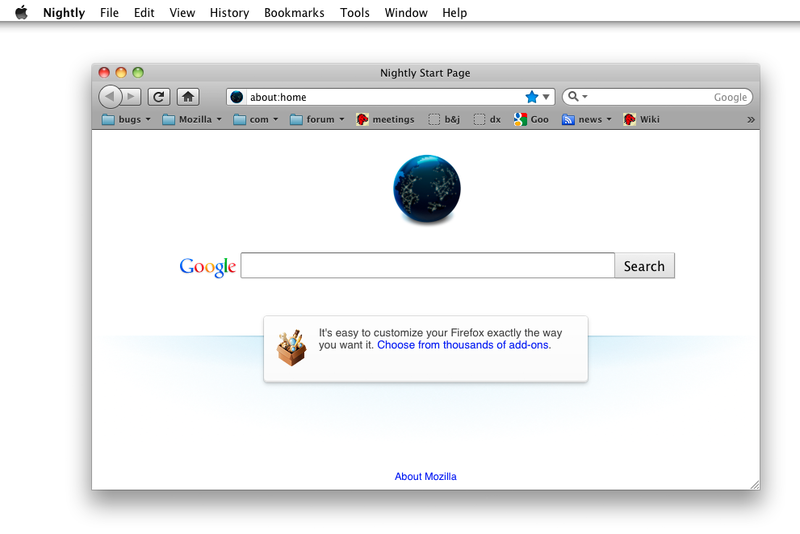 You should install public Firefox, not nightly build, before such tests. Nightly builds are by definition not for “normal users”. Excellent post. Very good read… Got to try out with our internal users (who have not yet seen our pdt) for our in-house product. Interesting article … The browser test is a good fit for the “Joe” type user. In other more specific scenarios, I don’t think that considering “Joe” to begin with is a very good idea. I’ve attended a user test session recently where the user was probably Joe’s age or may be a bit younger, but have been using computers on a daily basis. I’ve noticed that certain UI components that the young generation take for granted (accordion panels, drag-drop), just don’t make enough sense for that user. The question is: when trying to build modern web applications that have a diverse user base (age group, skillset, etc), at which point do you consider this type of user’s feedback valid and when do you just dismiss it? I had some experience with users who’d never used computers before (although fairly intelligent ones — mostly developing world experience, but some older people in the US too). Command lines were much easier to teach than GUIs. The basic concepts like menus, icons (and their meanings), text boxes, etc. were tough to teach, and even tougher to use — the next computer would have windows laid out slightly differently, or different color/theme settings, or whatever, and it would get very confused. Maximized vs. non-maximized windows were also a big deal. With command lines, everything was deterministic. This made a big difference. Except for the path you were in (which the command line shows), you could expect the computer to behave the same way every time. The concept of typing “mv filename filename” is much easier to explain than how to have two windows open side-by-side and drag an icon between them. such a great read. it’s nice to reflect on those that just don’t get it when we build something that we think just makes sense. It seems everyone is trying to defend the computer and not acknowledging there are many people out there who have no idea. It is easy when you know how. I would like to see those people put in front of a machine of some sort and told to operate it and see how they go – yes it is the same scenario. We know that we have to click in the box to type text – how? because we have been shown/watched others. Joe is right, he could use a course and they should be offered free for people of a certain age/education level/background. Technology advances every day and the more it does … to make our lives easier … the more involved it gets. This experiment was a great one. I have worked with many people that only know computers as far as their job goes and no more. So much I have learnt was by trial and error, but as a computer is a machine people believe they can break it if they do something wrong. I used to tell my staff to just try stuff and if it goes wrong let me know at the time so I can fix it – but even this was hard for some of them to believe. In the end computers are machinery and all machinery needs to be taught. This reminds me of the Tappers and Listeners experiment from Elizabeth Newton, Ph.D. (http://www.madetostick.com/excerpts/). The Tappers familiarity with the tune deafened them to the possibility that Listeners would not be able to detect what they were hearing. What makes sense to designers and programmers does not always make sense to consumers who are approaching products for the first time. I’m teaching my 72 year old father to use my mother’s computer now that she has passed away. I’m a software developer, and he is bar far the most challenging user I’ve come across. I read the bit about Joe getting a Gmail address, and it was all to do not to giggle out loud in my cube. Joe is not alone in being “frustrated” on these sites. even for those who have experience on computers they are often hard to navigate through. Hiding even the basics like login and find /search in obscure places. I think the site designers need to ask more basic users for guidance in their designs and use less “nerds” who want to make it look different and trendy. I remember when I migrated teachers’ notebooks to Windows 7 + Office 2007. I was a student in IT vocational school, and I’m on the “busy body” department there for technical support *got my entire school tuition subsidized though LOL*. A chemistry teacher who just got her school-subsidized notebook ranted about her inability to use her LPT printer and how she could no longer open her WordStar *yes, WordStar* files. When I came to her house to install her printer, I shocked because she still used a 486 PC with Windows 3.11. She was 60-something, so a sudden change scared her right away. I ended up coming there numerous times to explain how Word, and the all-new Windows 7, works, as well as accompanying her to buy LPT to USB converter *she hates to part with the printer xD*. Technology moved so fast, and yet it becomes more and more complicated with drastic changes over time. For us who played in this major, this shouldn’t be a problem, but how about people who haven’t even touched a mouse before, or one who’s still using whatever older version of a system? This research is definitely a clear call for interface designers. It’s quite a challenge to design an interface that’s straightforward for new users and not overly simplified for a power user, isn’t it? Completely false. Internet Explorer has always used http://www.msn.com as it’s home page. While I agree the advertisments don’t help, there is one little word which would help. Local. Point to Local and you’ll see Restaurants. Job done. 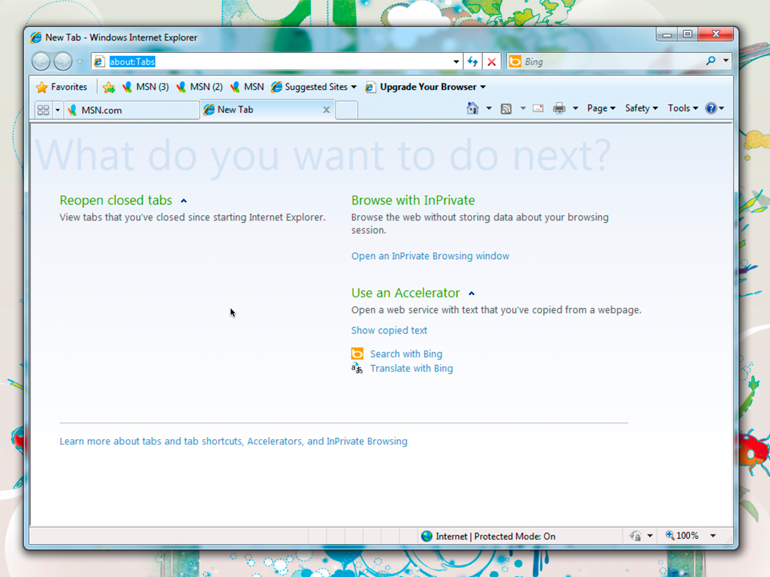 In fact, I observe MSN.com is in fact open on the first tab in the Internet Explorer screen shot. 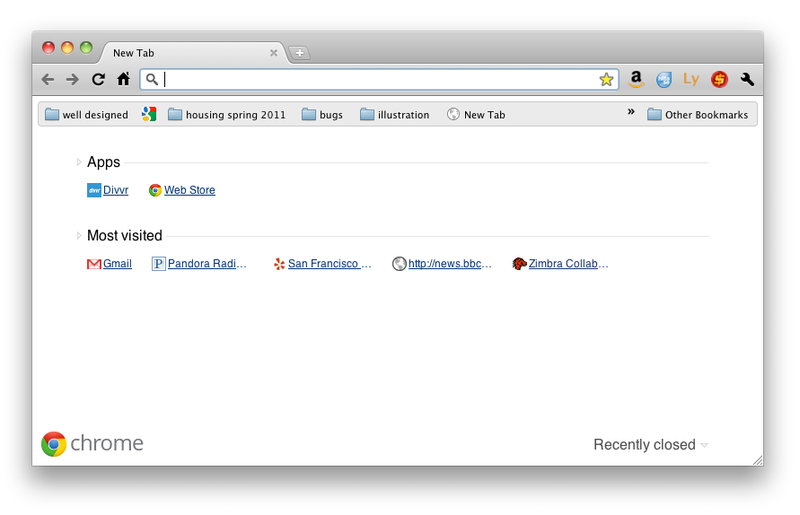 Therefore, I must ask why was a new blank tab opened? This can be fixed in Firefox by having a short sentence before the search box saying something like, “To find information, type what you are looking for and press the Search button”. Easy! we’re so lazy to learn technology that we expect technology to offer us everything. thie is where CHROME RULES!!!! This might sound arrogant, but let’s be honest here: I am currently 25 years old and I’ve never driven a car in my life. Now, I’m in Germany, in Cologne to be exact. Let me sit behind the wheel and tell me to drive to Duesseldorf. Should I expect the car to be intuitive enough to actually enable me to drive it safely, without putting anyone at risk? Should the entire industry of automobile-production put money and effort into usability-studies for people like me to make it possible for me to drive a car from Cologne to Duesseldorf, without taking lessons and putting effort into actually obtaining a driver’s license? Why do we expect computers to do what nothing else does? When I was in 6th grade,we were introduced to computers and started with theory first(bad idea). I never quite understood what a cursor is. The definition they taught us was “Cursor is a blinking character on the screen”. Until I got to do a hands-on, I never really understood what this blinking character was. To people complaining about the size of the type: Do you not own reading glasses? I wear 2.5 power and have no problem. I’m 51 and have needed glasses for everything for more than ten years; if I don’t wear them, I would only be able to read 18-point Arial Bold. I take them off to drive and play tennis. When I was 39, I could see a yellow dot that was 1/175 of an inch across, so I do feel your pain. I just don’t happen to feel my presbyopia should dictate publishers’ design decisions. Enlarging the text in your browser, with CMD-+ or Ctrl-+, is another option. If your text won’t enlarge, it means you are using Internet Explorer 6 or 7, an international security risk. You would do well to upgrade to version 9, or, better yet, use Firefox or Chrome. This is very familiar to me, as I’ve been trying to teach my mother (who is close to Joe’s age) to use a computer for the past eight months or so. She had the same problem with the idea of clicking into a text box to type, and though she’s made progress and uses Facebook and the like, she still finds computers intimidating, unintuitive, and very frustrating. Even typing is difficult, because she’s been writing longhand for years. It’s sometimes difficult for me to properly teach her as well, because though I am well-versed in Windows PCs, she is using a Mac, and so the interface is annoying for me. Sometimes I can’t immediately answer her questions because I dislike OSX and Apple hardware in general, and so I’m not that familiar with it. However, it’s probably true that Apple’s design philosophy is more suited to new users than Microsoft’s. The sad thing is that while this problem in general will go away in time, it is for that very reason that most designers won’t tackle it; younger generations already understand how to use computers and related technology, and the older generations will die out. In the meantime, however, those older people struggle with little hope of mastering the technology. I’ve been using computers since 1985, when I was 3 (including learning to add and subtract on a Commodore 64 and playing a Tetris knock-off on a Commodore PC-10). Trying to use a friend’s tablet computer, a Samsung? Confusing as hell without tooltips or a mouse. Pinch-to-enlarge, I could readily figure out. Trying to turn the wireless off and back on when there were four very similar icons available? Good luck. Very good lessons embedded in the story. It’s interesting information. It is a nice technique of testing users. It’s fascinating to learn that after all of the decades of user interface design research at Xerox PARC and elsewhere, the one thing that “Joe” relied upon was plain old text. Browser makers should read this post and incorporate design and functionality that is easily understandable for those persons who barely uses a computer. They can get valuable information from a person like Joe. Great post. I used to be checking constantly this weblog and I’m inspired! Very useful info particularly the closing part 🙂 I handle such information a lot. I used to be looking for this particular info for a long time. Thanks and best of luck. Bruce Lawson’s personal site : I hate computers, but I love what you can do with them. ¿Qué navegador es más amistoso con un debutante frente a un PC a sus 60 años? De eerste keer internet | Niet nuttig, of wel? What happens when someone who’s never touched a computer, touch it? | Feed blog! when you install the "belkin wireless router, do you run the installation disk on bot h computers, or just on?